The genus name is from the Sanskrit dhatt?rah (plant, thorn apple) and stramonium is originally from Greek, strychnos for “nightshade” and maniakos for “mad”. It is also known as Devil’s Apple, Apple of Peru, Stinkweed, Jamestown-weed. 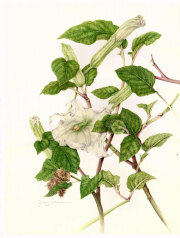 Jimson-weed, Devil’s Trumpet & moonflower. Little wonder that Susan spent days researching the correct identity of her daunting spiny seedpod, before confirming it as D. stramonium. A member of the nightshade family, it grows wild the world over, wherever it finds warm and moderate climes. Datura has a long history in folk medicine for the treatment of asthma, as an analgesic during surgery or bonesetting, in inducing abortions, providing relief for sore throat or toothache and in getting rid of parasites—to name just a few of its many uses. It was also an essential ingredient in love potions and witches’ brews if you ever needed some!